I've been hearing from a lot of teachers lately about getting thrown into teaching creative writing electives they weren't expecting! Been there. I was excited if a bit overwhelmed the year I took over my friend's "Creative Literature" course after she took a job in Northern California. 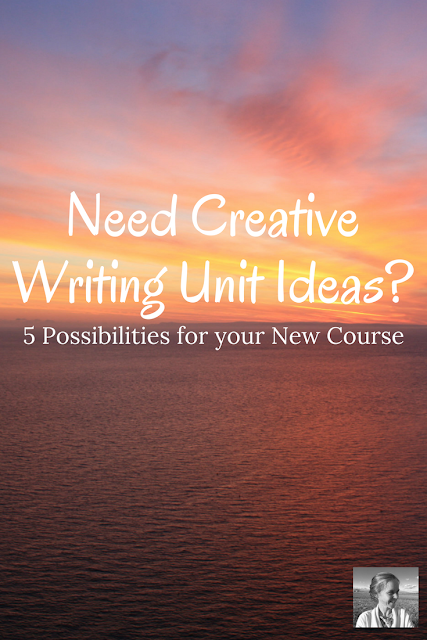 A creative writing course seems to flow out before you to the infinite horizon, am I right? There are so many different things you could do, and it's not easy to figure out a logical flow and pin down the assignments. 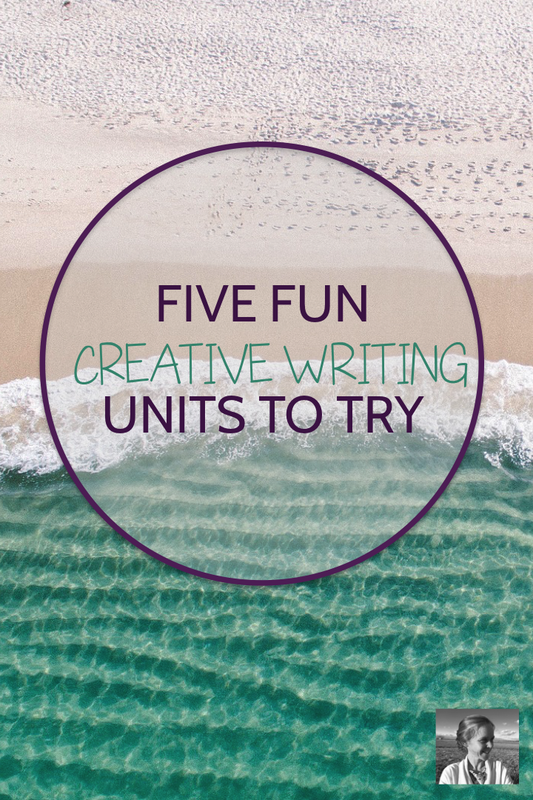 That's why in this post I'm pulling together a list of some of the best creative writing units I've done, dreamed of, or participated in as a student. If I was writing a brand new course right now, I would use every one of these units. I once assigned my American literature juniors an identity project. After reading a variety of pieces by American authors about their lives and experiences, my students produced a portfolio of works in different genres that shed light on their own identity. The results amazed me. If I was crafting this same project for a creative writing course, I would ask students to create a narrative of their lives using three or four genres linked together. Perhaps they would begin with memoir about their early childhood, move into a video of their own performance poetry about early childhood, transition into a travel piece representative of their teenage years and finish with a fictional story about their future. I would detail a big list of options for the different genres, examine a range of autobiographical pieces that reflected at least some of those genres, and hit the ground running. I've written here before about the power of writing contests. This particular contest allows for a range of creative options. From the website: "Writing encompasses creative nonfiction, novel, play or script, poetry, short story and spoken word. The strongest submissions demonstrate a sense of inventiveness, show attention to the complexities and technical aspects of language, and have a clear, original, and distinct point of view." Applications must be submitted by October 13th, and there IS an application fee, though it can be waived in the case of need. You could create the assignment around the application and then let students decide if they've worked hard enough on the piece to make it worth submitting. Or you could let the class vote on the top three and then try to find funding for those three to be entered. Angela Stockman's recent book, Make Writing, shows a classroom world in which students are inspired by what they make to take their writing in totally fresh, creative directions. I LOVE this idea. Spend some of the drearier months making your classroom into a maker space with your students, gathering materials and creating areas where they can design characters in paint before ink, settings out of cardboard and wire before words, conflicts in cartoons across chalkboards before spinning them out across pages. Design a maker unit, in which students create elements of their fiction before they write, and see what magic unfolds. As the weather begins to warm, get students going on writing one act plays in groups. If you want to pair the project with a mentor text, choose a play to read first and then have students brainstorm a list of themes from that play that they can incorporate into their own. Give them time to write and rehearse together. Then decide as a class when and where to hold your own one act play festival and invite guests. Consider letting students vote for several award-winning plays and hold your own awards ceremony when the performances conclude. As the year comes to a close, invite students to experiment with the genre of creative nonfiction. Somewhere between hard news and fiction, creative nonfiction is something many careers will need these days. Being able to describe people, places, ideas, and movements with striking words and beautiful lines will benefit your students enormously. Though you could explore all kinds of creative nonfiction, travel pieces stand out as a fun way to try this genre. Students could write about places they have been, about their very own hometowns, or even enjoy a little research (including video viewing) into a place they've always wanted to go and then write about it. Of course there are dozens more wonderful possibilities for creative writing units. You could write screenplays, memoirs, class poetry books, graphic novels, children's books, nursery rhymes, fairy tales. You could explore writing scifi, fantasy, mystery, YA, and more. The world is your oyster when it comes to a creative writing course, but these are just five fun possibilities to get you started. 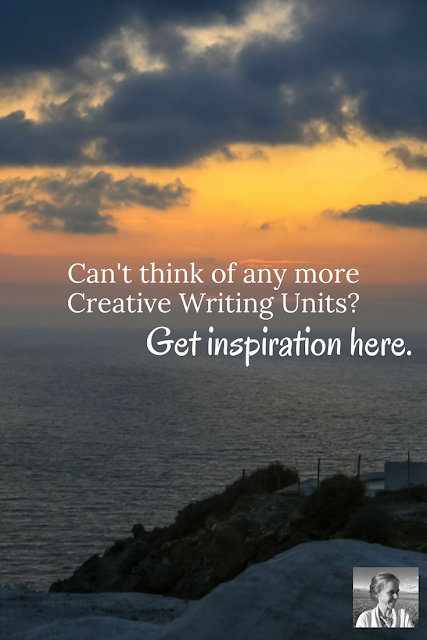 Want to share your favorite creative writing units and get inspired by those of other fabulous teachers? Hop on over into my free Facebook group, Creative High School English, where there are at least two threads on this topic right now! They are here for a major gathering and might be here they call numerous individuals who need to share thier learning. And furthermore share the look here of their working way of life. Expectation in the wake of taking this experience they should enhance their working style.